In this dynamic week long project of the Canadian artist Emma Waltraud Howes, Scores for Daily Living performances organically flow into discussions with curators, a workshop about rhythm and gravity, and a screening of video documentation. Howes artistic practice intertwines choreography with performance, video, sculpture, sound and various 2D media. Her works are based on observing gestures that spark public interventions, kinesthetic and architectural research. Expanding the principles of choreographic practice, Howes takes drawing as a basic component, graphically fixating performance in a score which then can be interpreted by orchestras, dancers and public. The performance will find its next step at the Cultural Center ZIL in Moscow, this multi cultural space located in a constructivist building – an epitome of Soviet ideas for communal living and interconnection enriched by a modern desire to make different types of experience accessible to wide audiences. 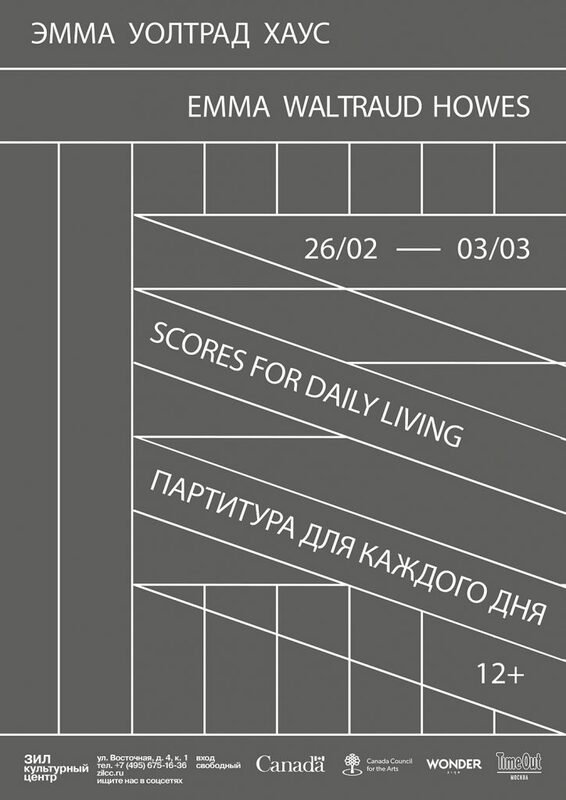 Such environment offers further exploration possibilities for the Scores to evolve and involve diverse layers of physical and ethical contact, inviting Moscovites to become a driving part in creating the performance composition.